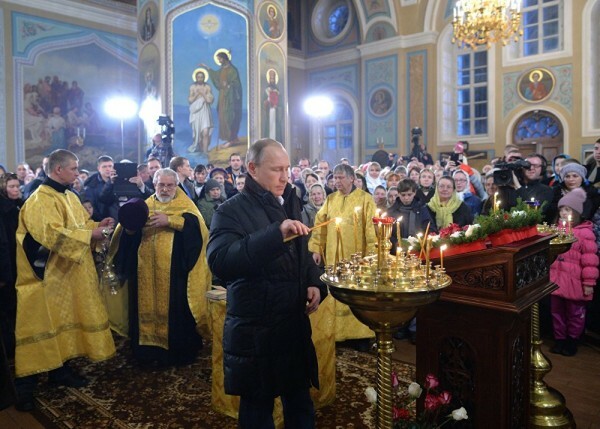 Russian President Vladimir Putin is celebrating Orthodox Christmas at the Church of the Intercession (Protecting Veil, or Pokrova) of the Mother of God in the village of Turginovo, located about 150 kilometers (90 miles) northwest of Moscow. MOSCOW (Sputnik) – The Russian leader attended a midnight service and lit a candle at the church where his parents were baptized in 1911 (according to records found in the regional archives). Putin visited the church’s spiritual-educational center for children, built after the Russian president received a relevant request from the church’s senior priest. In 2011, Putin presented the senior priest with an icon of the Mother of God made by an unknown master in the early 19th century. Russia celebrates Christmas on January 7, which corresponds with December 25 of the older Julian calendar.